Creating a niche of Food Processing Machines such as Amla Sherdding Machine, Shevaya Machine, Amla Punching Machines, Hydraulic Juice Extractor, Basket Press Juicer, Extruders Machines and many more items at its best, with utmost quality. Zigma International is one of the preferred choices of our clients for manufacturing, exporting and supplying Amla Shredding Machine. Made available in a varied range of specifications, in these efficient food-processing machines, only seeds are separated without cracking. The proffered selection can process both small & big size amlas and requires an extra dye set. We take immense happiness in introducing our company as a well-known manufacturer and supplier of Shevaya Machine. Fabricated using superior quality raw material sourced from reliable and authentic vendors of the industry, we are offering these products at highly rational prices. Offered by us in different designs, these offered products are widely known for their features like rust resistance and durability. 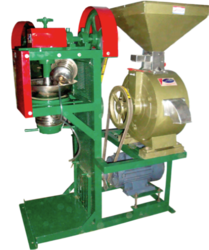 We are actively involved in manufacturing and supplying premium quality Amla Punching Machines. Widely utilized at Amla candy manufacturing factories and sweet processing industries, these punching machines are developed from stainless steel to ensure rugged performance. Further, our offered machine is widely acclaimed for its superior performance to punch Amla fruit without breaking the seed. Salient Features: All Contact parts are made up of SS At a time two amlas can be punched 6 no of through holes of 4 mm dia. can be made without breaking seed machine is paddle operated. That is call Zigma Amla Punching Machine. Machine Capacity: 60 to 80 Kg./hour. This Machine Also Known As Zigma Punching Amla Machine. We are one of the reputable firms manufacturing and supplying new generation Hydraulic Juice Extractor. Widely demanded by food and beverage industry these juice extractors operate on prevailing hydraulic mechanism to provide optimum performance at lower operational cost. Further, we are providing this high performing equipment with two jars and single phase and three phase motor capacity of 1hp and 3hp. Our technological adeptness has made us the pioneers of manufacturing and supplying leading quality Basket Press Juicer. Developed from premium grade stainless steel alloys, this juicer is highly appreciated for its faster operation. Our offered basket press juicer operates on an innovative mechanism to extract juice and available in jar size of 1 feet and dia height of 1.5 feet. We are well acclaimed as a prominent firm engaged in manufacturing and supplying high in demand Extruders Machines. Widely utilized to make Indian Sev, Gathiya, and Papdi, these machines are thoughtfully developed with extruder mechanism to provide uniformed output. Moreover, our prestigious clients can order these machines in chrome plated steel or aluminum construction. We have a complete devout in manufacturing and supplying high quality Namkin Machine. This machine is highly acclaimed for its finest performance in producing all kinds of Indian Sev. We have used energy efficient and high performing motor to operate this machine with assured performance and longevity. Further, our offered Namkin making machines are available in two models for its body, including aluminum and chrome plated steel. 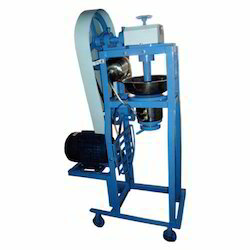 We are major entity actively involved in manufacturing and supplying an exclusive range ofMango Pulper Machines. This machine is widely acclaimed for its versatility in creating pulp of mango, emblic myrobalan, tamarind fruits, custard apples, and chiku fruits. Available in brush type and canvas screw type model, this high performing machine is constructed from stainless steel material and powered by 1hp Single Phase motor. Owing to our extreme prowess in the domain, we are manufacturing an extensive range ofBanana Chips Machines. Our offered machines can produce round and oval shaped chips with optimum feeding speed. Developed from 304 grade forged steel and aluminum, these machines are powered by a high performing 0.5 hp single phase motor. Single Phase Capacity: 60/80 kg/hr. We have for our client commercial wet & dry pulverizer that have hardened as well as fully machined & balanced beaters. These Pulverizers are popular for continuous pulverising and suitable for wet-pulpy and dry crushing. Offered in compact size wet & dry Pulverizer do not require too much space. Our commercial wet and dry pulverizers are used for pulverizing different types of product like spices, fresh ginger, salt, garlic, sugar, fresh fruits, vegetables, beetle nuts, leaves, oil cake, cattle and poultry feeds, icing sugar, costarred powder, instant food, food colors and allied food production. Backed by a team of experienced and skilled professionals, our company brings forth Amla Juice Making Machine at affordable rates. The proposed selection is appreciated for its excellent operating speed, longer functional life and good capacity. This amla juice-making machine is manufactured in adherence to the predefined industry standards. Amla juice making machine is provided in tamper proof packaging. 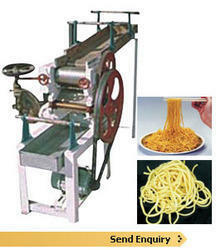 We are among the eminent manufacturers and exporters of Noodle Making Machines in the industry. Our experts have precisely designed these machines in compliance with the prevailing industry standards using optimum quality materials. These machines function in a highly efficient manner and provide consistent output to the customers. Easy to install and operate, these machines are highly regarded by the customers. We make these machines available at standard market prices to our valuable customers. This Machine Also Known As Stainless Steel Pulverizers, Steel Pulverizers. We are Sewai Making Machine counted among one of the leading manufacturers and suppliers of a wide array of Automatic sewai Machines. The machines offered by us are manufactured using optimum quality raw material, which is procured from the authentic vendors of the market. Moreover, the machines offered by us are tested on various parameters to ensure their adherence with the international standards. We are amongst the leading manufacturers and suppliers of quality Vermicelli Making Machine. which is specially designed for small cottage industries. This machine is popular among our clients’ as it can be easily operated and durable in its nature. It comprises of a stainless steel water cooling pot and for the protection of the operator, we have specially designed gear cover. Moreover, a special arrangement of a fan is given for drying the sewai. Pineapple Pulp Making Machine offeredfind use in homes and hotels and helps in extracting pure juice by separating it from seeds, skins & pulp. With the machines available in different capacities, these are low in maintenance, efficient, durable to use. Providing for long lasting working support, it is best suitable for taking out pure juice from citrus fruits and features quick and efficient extracting process. Its stainless steel fabricated finish also makes these long lasting in use. Being easy to clean juicer, it can also be used for Oranges, Mosambi, Pineapple, Anar, Grapes, Sweet lemon and other fruits. Salient Features: Dryer Machine - Drying Machines Available in Metal Steel and Stainless Steel body. Dryer Machines Drying Machines loaded material can be taken out easily. The papaya pulp production line Can deal with similar characteristic of fruits. We are engaged in offering Ginger Processing Machine. Mixing processes can be performed in batch or continuous mode. With a continuous process, the particular challenge is to continuously weigh the individual mixing components precisely in accordance with the formula. In addition, the desired homogeneity must be reliably achieved within a given short mixing time. The purpose of this work was to determine the influence of air temperature, sample diameter and antioxidants on water activity, moisture content and colour difference of thinly sliced mango in a fluidized bed and tray dryer. Mango samples were treated with antioxidants solutions (ascorbic and citric acid) before the drying process. Fluidized bed and tray drying of control and treated samples were carried out at two temperatures: 50 and 60 �C. We are manufacturing and supplying of best quality Groundnut Skin Removing Machine.Tough and supreme quality metals are used in making of these machines. 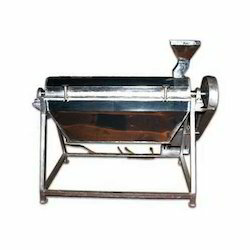 Used for removing the outer-skin of roasted groundnut and breaking it into two parts, these machines are made by using latest of machinery and skillful professionals. Available with capacity of 50Kg/hr onwards, these machines works in single and three phase.